While the initial purchase of each of these Traps will require Dreadstone, subsequent upgrades to U.R. Mines (which will increase their damage) will require Gold. 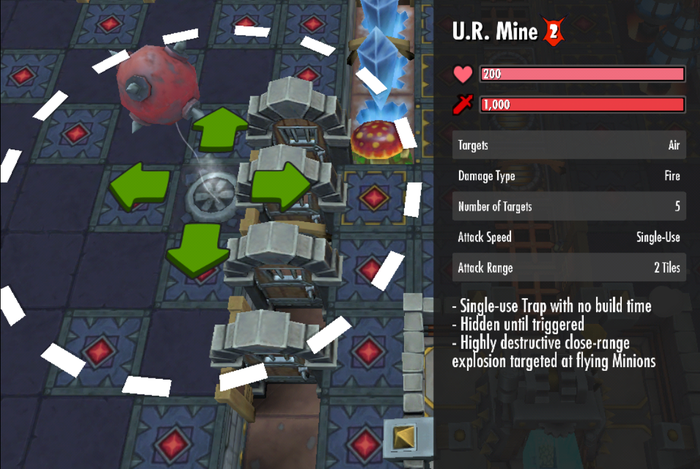 As they are consumable, each Mine will only fire once before needing to be re-armed. What currency is needed to re-arm U.R. mine? I don't have any dreadstone yet, but when I do, I will definitely get these last after Dante's and possibly Mortimer. Who would spend 50 dreadstone on a expendable otherwise? Keithustus wrote: I don't have any dreadstone yet, but when I do, I will definitely get these last after Dante's and possibly Mortimer. Who would spend 50 dreadstone on a expendable otherwise? It only cost Dreadstones for the initial purchase. It cost gold to rearm them from that point forward. They are a pretty awesome trap as they give you yet another way to combat flying units. They are basically a Chicken Bomb against flying units. Very versatile and at only 50 Dreadstones cost, also the most affordable of the new content. Da Grud wrote: It only cost Dreadstones for the initial purchase. It cost gold to rearm them from that point forward. Woa, much better than I thought. Thanks! The OP doesn't actually say it only requires gold to re-arm; it says to use gold to upgrade, so I wonder how many others won't buy them because they don't read the forums and make the same mistake as I did? Maybe the in-game description should say re-arming doesn't cost dreadstone? hmm cant spell like dragon breath kill them? Grimgor wrote: hmm cant spell like dragon breath kill them? Dragon Breath will reveal the traps but it does NOT do any damage to them. Da Grud wrote: Dragon Breath will reveal the traps but it does NOT do any damage to them. What the hell? Why did they change that? They must think nerfed disable traps is the only justifiable way to stop them with magic?